Scion Living is an upbeat British brand known for its zesty colours, friendly characters and clean Scandi-inspired designs featuring Scion Mr Fox, Lintu, Spike hedgehog, Barney Owl & Colin Crane. Their designs are available right here at MAKE International on the Scion range of tableware including mugs, espresso cups, bowls, egg cups, placemats, glassware, coasters and more. Scion burst onto the scene back in 2012 as the newest member of the Harlequin family. The word Scion has two meanings, a ‘young shoot or twig’ and a ‘descendent from a notable family’, so it’s the perfect name for the brand! Scion Living was conceived to fill a gap in the market for unique, vibrant and reasonably priced home products. The brand really kicked off when one of the Scion designers drew a little orange fox – Mr Fox was created and rapidly became Scion’s most iconic design. Followed later by the arrival of Spike the hedgehog, the distinctive style of Scion Living aims to provide fresh ideas for modern living. Now with many more patterns and new characters, Scion living continues to expand. The Scion designers work in their large studio in Leicestershire. Their delightful designs are firstly placed on fabric and wallpaper before being later partnered with specialist manufacturers under licence. MAKE International owns the license for Scion ceramics, glassware and tableware and produces Scion mugs, egg cups, espresso cups, glasses, placemats and coasters. Mr Fox and friends can also be found on things like bed linen, rugs, towels, bathroom accessories and much more under other licenses. Scion is proud to be very British, hence the fox and hedgehog designs, and are committed to using environmentally friendly and sustainable factories. 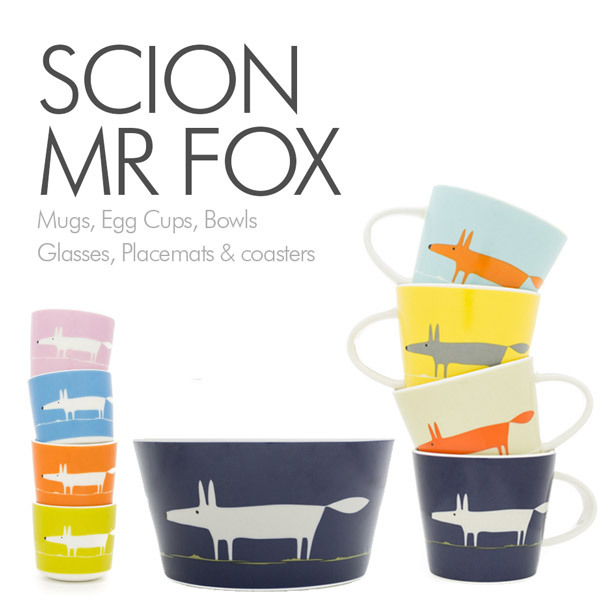 Scion’s most iconic design…explore all the trendy variations of Mr Fox on designer mugs, espresso cups, bowls, placemats & egg cups.